Angelo Capparella is a member of the John Wesley Powell Audubon Society and participated in the Christmas Bird Count last month. The John Wesley Powell Audubon Society participated in last month's 119th annual Christmas Bird Count. Audubon society member and ISU Associate Professor Angelo Capparella said this year’s count set a record for bald eagles spotted in the county. But Capparella also noted the Christmas Bird Count showed fewer species than in previous years. This year, the Audubon Society reported 59 species of birds. He said recent years showed counts somewhere in the mid-60s. Usually species counts depend on the abundance of open water, like reservoirs and ponds, Capparella said. The Christmas Bird Count is used to show how birds adapt to climate change by adjusting their wintering ranges, Capparella explained. He said the changes confuse birds as to where they should migrate to and when, and where to find food sources. “This kind of data has been feeding into the climate reports showing that a lot of our birds are going to be really stressed through this human-caused climate change,” he said. The Christmas Bird Count is organized by the National Audubon Society. The local audubon society has participated since 1967. It’s a perfect night to watch for nocturnal birds. Calm winds, clear sky and waxing moon just above the horizon. I’m standing at dusk on the Lexington Blacktop, just east of Lake Bloomington. I’m with Angelo Capparella of the biology department at Illinois State University, and Given Harper, another avid bird watcher and professor at Illinois Wesleyan. We’re on the prowl for owls. This week when all the little ghouls and goblins roam the street looking for fun size Snickers bars, they’ll trick-or-treat past the usual mix of spooky Halloween decorations—cobwebs, jack-o-lanterns, fake tombstones, and bats. Two of Illinois’ most popular parks are getting bigger --- a lot bigger. The state is buying more than 2, 600 acres next to Starved Rock and Matthiessen State Parks from Lone Star Industries, Inc. The partially restored land had been used for mining, first coal and later limestone, since the early 1900s. Illinois Gov. 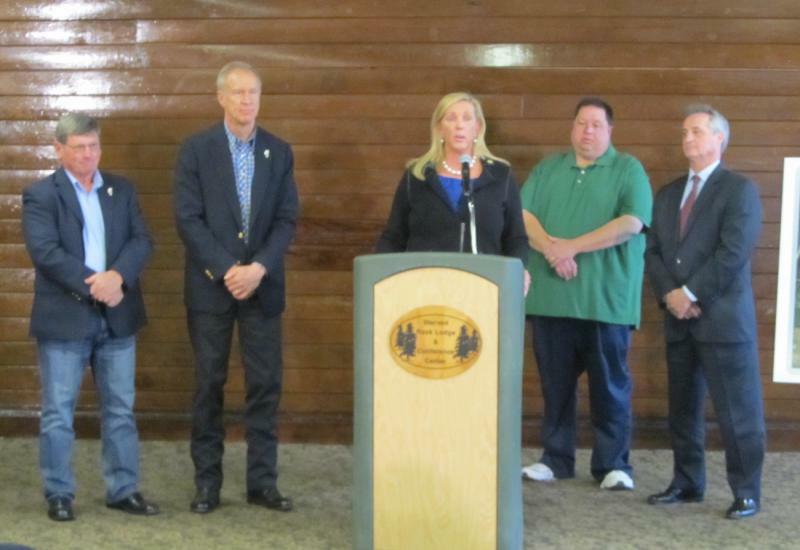 Bruce Rauner said the purchase will enhance the parks’ appeal. McLean County residents looking for outdoor recreational spaces and activities have a new online resource which compiles accessible greenways in the county.